Hear that? The Pope says we have gifts. With news of the pro-gay amendment failing, the Pope, being the Beyoncé-level sass master he is, proclaimed that “God is not afraid of new things,” in mass the next day. Shade had been thrown. Now, this isn’t to say the Pope wants the Catholic Church to unconditionally love and support gays in every endeavor. No, no, no. We gays would still be sinners, but would have the opportunity to join the Catholic Church that labels us as such. Gee, sounds like a great deal. We don’t want to be a part of your Jesus club anyway. The main reason cited among bishops for voting down a gay-friendly amendment was that it would “create confusion” among Catholics regarding Catholic doctrine, as if confusion is the farthest thing from Catholicism and religion in general. Since the Bible is often used as the primary weapon against homosexuality, most LGBTQ+ individuals are deterred from religion and Christianity in particular. Because of this, it’s unlikely that the Pope’s declarations will win any gays over to Catholicism. We honestly couldn’t care less about what a little old man in a cute white hat thinks of us. The Pope’s move wasn’t aimed toward gays, but to everyone else in the world (especially those basic bishops). 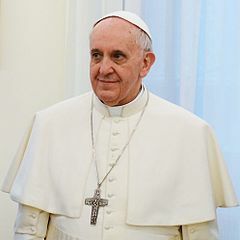 With the church’s figurehead preaching acceptance (and not just tolerance) of gays, it’s also possible that hostile Catholic friends and family of gay individuals may follow the Pope’s lead and become more open to LGBTQ+ people. Additionally, this new lax view on homosexuality is likely the Pope’s attempt to win favor over a younger, more liberal generation that has drifted further and further away from organized religion. The Catholic Church isn’t the powerhouse it once was back in the day, and showing that the church is open to changing its rigid, centuries-old rules demonstrates that it isn’t the big scary church of yesteryear. I’m just glad someone as prominent as the Pope is addressing gay people. Years ago, we wouldn’t have even been acknowledged. The gay rights movement is now so loud that even the Vatican can’t ignore it. Before you know it, everyone will be okay with us getting gay married, having gay weddings and eventually gay worshipping Jesus. Watch out, world – it’s 2014. The gays are unstoppable, we’ve got a sassy pope and ain’t no bishops gonna tell us or the Pope what to think.